Let me start off by saying that I’m not one to judge…unless someone actually asks me to. This was a particularly easy decision, because only last year, I’d had a rewarding stint as a judge for three categories of the national BMA B2 Awards. 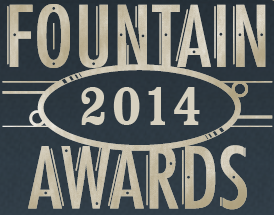 I anticipated an equally exciting opportunity at the Fountain Awards. NOTE TO SELF: Before continuing, I must thank Lori for supporting my involvement, despite the short notice, and Marilee, the ED of the Colorado BMA, for recommending me. Team Larry in full force. Thank you both! So, back to my Midwest adventure. I departed on a Thursday afternoon and arrived in Missouri, or maybe Kansas. As the BMA team shuttled me hither and yon, over state lines and back, I was geographically baffled but in very good hands. Everyone I met was amazingly nice, thoroughly professional, and always on task. In my book, the Midwestern reputation for hospitality remains firmly intact. Starting early the next morning, I worked alongside two other judges to individually grade over 150 entries in 13 categories, from integrated campaigns to display marketing to digital marketing to live events. A few of the categories had only a single entry, which was not a guarantee of a win, while others (e.g., logos, print ads) were brimming over with submissions, requiring far more concentration to discern a winner. After nine straight hours, we’d completed our work and selected a final “Best in Show.” Drained and numb, but pleased with my contribution, I returned to Denver late the same night. The awards will be given out on Monday, March 24. Complete the form like you mean it. If you’re going through the lengthy process of entering your campaign or logo or video, make sure to offer as much detail as possible on your submission form, because that’s the judges’ only window into your world! Strong creative means nothing without context. Be witty. Be informative. Show your passion. And if you’re vying in multiple categories, don’t reuse copy. It’s boring for the judges and shows a lack of initiative. Always measure on your objectives. In casual conversations, we three judges all expressed general frustration over entries that failed to measure or did not think creatively about measuring results. Some campaigns were spot on for their objectives but withered away on performance. We now live in an age of data-driven marketing, and if you use a URL or QR code or call to action on an ad, it’s so much easier to track results. Otherwise, why market at all? Good marketing is still hard and not common. Our mandate was to judge on four criteria: creative, production, objective / strategy and results. I read quite a few submissions that fumbled painfully on their promise in one or more of these categories. Was it lack of focus? Lack of planning? Hard to say. The best submissions were clearly those that showed a distinct understanding of the target market, enough originality to make an impression, and proven results. The bi-state Greater Kansas City area is indeed home to a vibrant marketing community. It was a distinct honor to serve as a judge of the Fountain Awards. My thanks to the team there for the privilege of viewing so many real world marketing case studies.